The intelligent young man has been driven to become a record-breaking jockey out of love and wanting to make his family proud. Many people assume jockeys are not the brightest people and only do the job because of their stature. Anyone with that perception need only spend five minutes with South Africa’s current champion apprentice, Lyle Hewitson, to debunk that belief. Hewitson has not only been a trailblazer on the racetrack but a look at his matric results will tell you he could have studied anything he wanted at any university in the country. He first received a sports scholarship to Kearsney College in Durban and as his academic proficiency began to match his sporting prowess, that scholarship was extended. Determined to have that all-important education before going to the SA Jockey Academy, Hewitson completed his matric with five distinctions and two Bs. “Even those two Bs were marks of 79%. I had both remarked hoping to get that extra 1% but got no luck,” he says. But while he was doing all this, Hewitson was already participating in his first love – to ride horses. He joined the work riders’ programme run by James Maree and would come up to Joburg on weekends to ride in those races. It soon became clear we were watching somebody special. He dominated against riders who were older, stronger and more experienced and when he finally joined the Jockey Academy in January 2016, expectations were high. There were others who had used the same route to get into the academy, the most successful of whom at that stage was undoubtedly Gavin Lerena, but most had found the jump from part-timer to professional too tough to handle. Not Hewitson. Within three months he had achieved the unthinkable – lost his complete apprentice allowance. When an apprentice starts at the academy, in order to make them more competitive against skilled jockeys they are given a 4kg claim. That drops to 2.5kg after 20 wins, 1.5kg after 40 wins and disappears completely after 60 wins. It takes most apprentices anywhere between two and five years to lose their allowances. On March 6 this year, Hewitson broke another record. 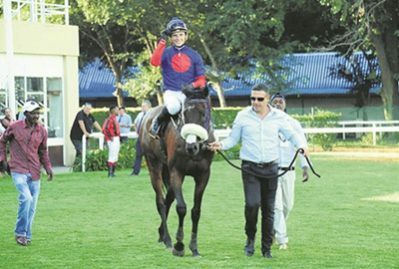 Riding a horse called Shenanigans at the Vaal Racecourse to his 285th victory in two years and two months, the 21-yearold surpassed Gavin Lerena’s record of 284 wins by an apprentice. It took Lerena 3 326 rides and five years to reach 284 winners, Hewitson took 2 792 rides to achieve his 285 victories. So what drives an intelligent, polite and well-spoken young man to become a jockey? “I really love working with horses and being around horses,” says Hewitson. “I love racing and my life revolves around it. If I was an accountant I would still ride to work in the morning. After all, I’m earning money for engaging in my hobby. Hewitson was always around horses. His father, Carl, was a jockey and is currently assistant trainer to Yvette Bremner in Port Elizabeth. His mother, Samantha, was a keen rider and owned horses. “I could never feel nervous of horses,” said Hewitson. “From a very young age I would go down to the stables and spend time with them. I remember when I was about 10 years old Sacred Season, who was my mother’s favourite horse, was suffering from colic. She eventually had to leave as she was going out for dinner but I refused to go. I didn’t want to leave and I slept in the stable with the horse. Hewitson believes that much of his success has come as the result of good preparation. “I enjoy riding work because when I get out and ride I get the feel of the horses and you get your body in muscle memory mode for the race ahead. “I make myself believe everything is easy as long as I am well prepared. Before every race I practise it in my head – who I should follow, whether an outside run may be a better option than going in. I almost simulcast it in my head. With these records coming thick and fast, Hewitson often has to reset his objectives. “I prefer to set short-term goals each month instead of just setting long-term goals. It’s a process in which lots of little goals come together,” he says. But he admits that he is also caught up in his own achievements. “Sometimes I forget I am a young rider and I will make mistakes. Because of the success I forget I’m still a novice. I’m not good at handling criticism but I don’t mind so much as long as it is constructive. He feels his main strengths are being all-rounded, hard-working, communicating well and his love of working with horses. His enthusiasm, however, did cost him early on. He was out for six weeks with a broken collarbone and “because I was so eager I ended up with many suspensions”. As far as weaknesses go, Hewitson feels he needs to be a little more aggressive. When asked what his ultimate achievement is, Hewitson becomes quite emotional.